Total Area: 1941 Sq. Ft. Optional Sun room: 224 Sq. Ft. 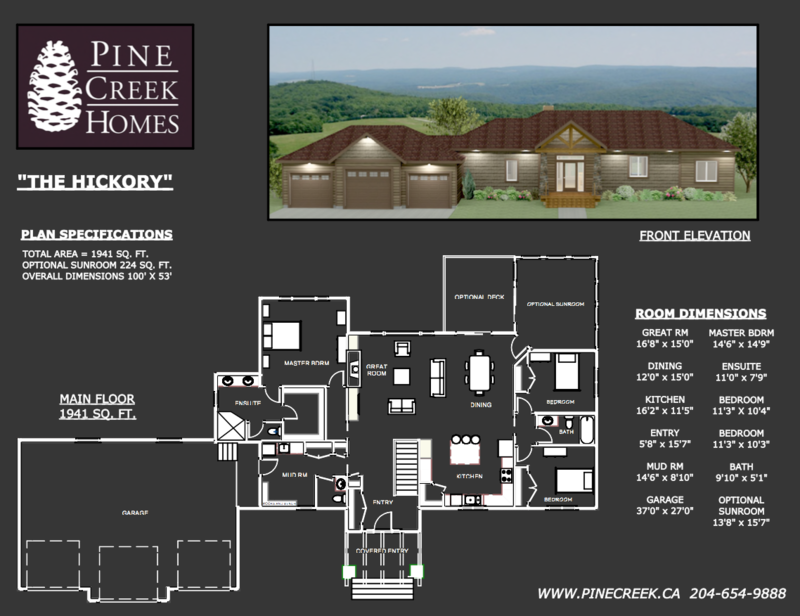 This three bedroom, three bath, 1,941 square foot bungalow has a really nice design and layout. The design has a fairly wide footprint and was originally created for a country lot. The timber frame covered entry and the built out garage gable give some dimension and character to the front of this home. Walking into the home through a timber covered entryway, you can immediately see right through the open space of the great room with lots of natural light from the large rear window and patio door. The living area is situated around the built-in fireplace and entertainment unit, and is directly in front of the biggest window in the house, allowing you to soak in the natural light and take in the view that your lot has to offer. The kitchen is a large U shape with an eat-in island in the center. There’s plenty of working space available and a nice corner pantry for food storage. The kitchen doesn’t impede on the living area in this home, but still feels like a part of the great room. The master suite is separate from the other two bedrooms and located on the opposite side of the home for added privacy. The ensuite features double sinks and a separate room for the toilet. With a large walk-in closet and a big window looking into the backyard, this master suite has everything you need. One optional feature that I love, is the sunroom and deck. The sunroom features opening windows on three sides for maximum sunlight and air flow. It’s becoming much more popular now to do a four season sunroom as our winters are so long in Manitoba and that’s really when we want some extra space. The garage in this design is an oversize triple with extra depth in the center bay for a longer vehicle. It walks into a large entryway with plenty of space for coats and boots, and a conveniently located washroom when you’re coming in from outside.